When considering mid-size luxury SUVs, the name Mercedes-Benz may not be the first to spring to mind. They have long been known for motoring achievements in the coupe and sedan classes, but were a bit late to the party when they entered the SUV market in 1997. However, the new 2015 Mercedes-Benz M-Class demonstrates the carmaker’s ability to craft that same superior driving experience for the SUV. For 2015, the biggest change to the Mercedes-Benz M-Class is under the hood. Two new classes with smaller, turbocharged engines give up a little power in favor of efficiency. The four-cylinder ML250 Bluetec diesel replaces the V6 ML350, while the gasoline-powered V6 ML400 takes up the V8 ML550’s spot. Additionally, the entire M-Class now carries an engine stop/start system to further increase efficiency. Aside from that, the M-Class remains fairly consistent since its 2012 redesign. Hands down, the M-Class rates among the safest in its category. The Insurance Institute for Highway Safety gives the M-Class perfect ratings. It also offers a more comprehensive list of safety features than several rivals, including the Cadillac SRX and the Lexus RS350. As mentioned above, the 2015 Mercedes-Benz M-Class makes fuel efficiency a priority in a class of traditionally thirsty vehicles. The new ML250 Bluetec diesel, for instance, rates better than both the BMW X5 and the Porsche Cayenne in this area. Mercedes-Benz has long been known for turning mansions into cars by producing interiors that surround the driver in unparalleled comfort. The M-Class maintains this tradition with fine leatherette upholstery, heated front seats, and dual-zone automatic climate control. Drivers consistently give the interior high marks for comfort and rear visibility. The M-Class doesn’t forget the “U” in SUV. With the rear eats up, the M-Class boasts 38.2 cubic feet of storage, and flipping the seats down sends that figure to 80.3 cubic feet. That’s about 30% more space than both the BMW X5 and Porsche Cayenne. Standard features in all models include: power sunroof, HD Radio, USB ports, Bluetooth support, automatic garage door opener, and Mercedes’ COMAND infotainment system running everything from its 7-inch display screen. If the standard package isn’t enough, the M-Class has plenty more to offer. After all, no luxury SUV is complete without cramming in as many space-age options as possible. A rear-seat DVD entertainment system and choice of Harman Kardon or Bang & Olufsen audio systems are available to further spice up the interior. Additionally, Mercedes offers more practical features such as adaptive cruise control, blind spot monitoring and lane keep assist. Most models of the M-Class come standard with 4Matic all-wheel-drive, which helps provide smooth handling and allows for a more tranquil driving experience. Those who need superior performance from a luxury SUV will opt for the ML63 AMG model. A 5.5-liter twin-turbo V8 pushing 518 horsepower delivers the power and speed drivers have come to expect from the AMG brand. Sport upgrades to the suspension, front seats, and steering wheel help control this beastly model. The M-Class satisfies a wide range of driving needs, from the economical ML250 Bluetec to the bombastic ML63 AMG, with the base ML350 sitting neatly in the middle. Let’s face it, there’s just something about a Mercedes. Owning one lets the world know you have arrived. Whether on the road or the racetrack, Mercedes is a name that has long been synonymous with excellence in motoring. After all, how many kids go to sleep dreaming of one day owning a Lexus RS350? One thing the M-Class lacks is agility and responsiveness. It seems in Mercedes’ mind, the ideal M-Class owner uses it to take the kids to school, comes home, and then takes the SL out for a spin. Look elsewhere if zipping through canyon roads is a high priority. Looking for fuel efficiency in an SUV is counter-intuitive. Going from 17 to 24 mpg is certainly a big leap in percentage, but it’s still 24 mpg. Buyers in this market shouldn’t be overly concerned with this factor. At times, the M-Class feels like something to buy if money is no object and you simply must have a Mercedes. Aside from the advanced gadgetry, the Jeep Grand Cherokee will handle all kinds of high-end soccer mom duties for about $20,000 less. 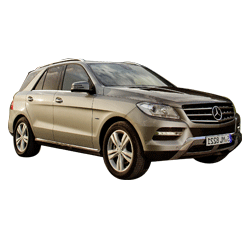 The M-Class is a solidly crafted entry into the mid-size luxury SUV market. What set it apart from similar makes in this class is interior luxury and safety. These two categories are generally high priorities when shopping for a vehicle in this class. A side-by-side comparison with the Cadillac SRX and the BMW X5 reveal that the M-Class offers much more in both categories. Basing a luxury SUV buying decision on handling is like choosing between a Ferrari and a McLaren based on trunk space. Doesn’t make a lot of sense. Are there more exciting choices in the mid-size luxury SUV market? Sure. But in the end, this class is about comfort and serenity, not necessarily blazing speed and tight turns. In this sense, the M-Class delivers and then some.